"Professor Williams has crafted an elegant, inspiring road map to help us all become global change agents equipped to cross boundaries, break down silos, and mend our fractured societies to solve multi-dimensional challenges. Williams builds his case for change from his own field experiences, including early work with the nomadic Penan tribe, to interviews with a great number of courageous change agent-leaders, including heads of state, all of who learn from their failures as well as from their successes. Williams challenges us to take responsibility for our cultural lens and biases – to strip out the barriers of our own creation. He lays out the myriad ways we humans have created a world which is flawed and fractured, yet he inspires us to make the world a better place, with humor, empathy, creativity, resilience, and most of all, with higher purpose. In today’s world of deep divisions, mired in strife, Williams finds beauty and makes me believe we can and we should heal ourselves." "Leadership for a fractured World’ is a practitioner’s delight and Dean Williams has brought out in a simple but yet profound manner what it takes to lead adaptively in a world that is getting increasingly complex and divisive. Building on the spiritual undercurrent of interconnectedness and reciprocity, this book is a must read for all those restless with the status quo and wanting to make the world a better place." "This is a great guide for those seeking to understand secret of leadership - and why we need it more than ever in this crazy, dynamic, and fractured world!" “Individuals can make a difference, particularly if they are willing to exercise good leadership. In part this may be instinctive, but much of it can be learned. 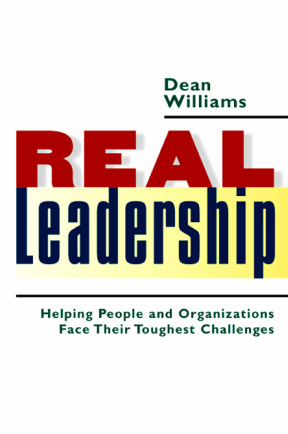 I welcome the broad and refreshing approach Dean Williams adopts in "Real Leadership," which should help to foster new leadership."